Among the taxidermal specimens in Harvard’s Museum of Comparative Zoology, past centuries-old fur coats, arises a flicker of brilliant blue. This is the spangled cotinga. Surprisingly, the cotinga is about as old as everything in the room, but its color is still as dazzling as the day it was brought to the museum. The cotinga—or rather its feathers—achieve this effect through structural color. Unlike color that we usually think of, which arises from paints and dyes absorbing certain wavelengths of light and reflecting the remainder, structural color is created when an object’s very nanostructure amplifies a specific wavelength. Cells in the cotinga’s feathers have a series of tiny pores spaced just right so that blues (and not much of anything else) are reflected back to our eyes. Because of this, if the feathers were thoroughly pulverized, the formation of pores and therefore the color would be lost. It also means that the same color could be produced from an entirely different material, if one could recreate the same pattern made by the feathers' pores. Researchers led by Vinothan N. Manoharan at the Harvard School of Engineering and Applied Sciences want to recreate this effect, giving man-made materials structural color. 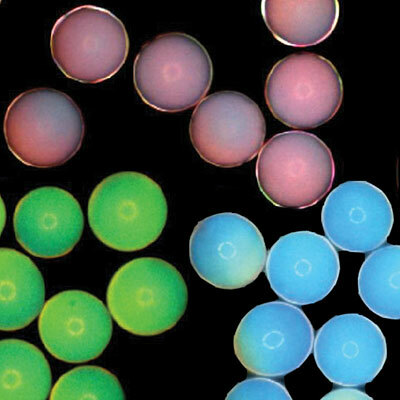 Producing structural color is not easy, though; it often requires a material’s molecules to be in a very specific crystalline pattern, like the natural structure of an opal, which reflects a wide array of colors. But the pores on the cotinga’s feathers lack a regular order and are therefore a prime target for imitation. Manoharan's lab has devised a system where microcapsules are filled with a disordered solution of even smaller particles suspended in water. When the microcapsule is partly dried out, it shrinks, bringing the particles closer and closer together. Eventually the average distance between all the particles will give rise to a specific reflected color from the capsule. Shrink the capsule a bit more, and they become another color, and then another. “There’s an average distance between particles, even though there is no ordering in the particles. It’s that average distance that is important in determining the color,” says Manoharan, Gordon McKay Professor of Chemical Engineering and Professor of Physics at Harvard. The findings have been published in the journal Angewandte Chemie. The current project expands on research conducted at Yale University in 2009, which aimed to mimic the cotinga’s hue and showed that dried aggregates of solid particles could create blues. Jin-Gyu Park was a postdoctoral researcher there and is now a research associate in Manoharan’s group at Harvard SEAS, which specializes in the physics of colloidal suspensions. With Park as lead author, the new paper demonstrates the production of colors across the spectrum, and the new encapsulation system. The tunable color capsules present interesting technological opportunities, says Manoharan. For example, a whole spectrum of new paints might be created using suspended capsules. Rather than harvesting from nature or preparing specialty chemicals, one for each color, these capsules could provide a universal and direct path to any desired color. The capsules might also offer a safety advantage. The reason for using natural dyes like carmine is that many synthetic dyes are toxic. The new color capsules can be made with particles of almost any material in the right structural formation, so toxicity can be easily avoided. Most compelling of all, however, is that some structural colors found in nature can last indefinitely as long as the colored object remains intact. “Most color you get in paints, coatings or cosmetics, even, comes from the selective absorption and reflection of light. What that means is that the material is absorbing some energy, and that means that over time, the material will fade,” says Manoharan. The sun’s energy pummels the molecules in conventional pigments. Eventually, the molecules simply deteriorate and no longer absorb the colors they used to, leading to sun bleaching. Manoharan’s group is currently testing their innovation to see if it can create an effectively ageless color. The Harvard Office of Technology Development has filed a provisional patent and is working with Manoharan’s lab to pursue the commercialization of the color capsule technology. Manoharan’s and Park’s coauthors were Sofia Magkiriadou, a Ph.D. student in physics at the Harvard Graduate School of Arts and Sciences; Shin-Hyun Kim and Tae Min Choi at the Korea Advanced Institute of Science and Technology; and Young-Seok Kim at Korea Electronics Technology Institute. This research was supported by an International Collaboration grant from the Ministry of Trade, Industry & Energy of Korea, and by the Harvard Materials Research Science and Engineering Center through the U.S. National Science Foundation (NSF). The work was performed in part at the NSF-supported Center for Nanoscale Systems at Harvard University.